On December 13, 2013, a luncheon talk was held at the offices of O'Melveny & Myers LLP which was attended by an audience of 15 dedicated members. Speakers James Ford, Partner of O'Melveny & Myers LLP, and Angelica Kwan, US Tax Partner of the PricewaterhouseCoopers Limited, shared their expertise on the current updates of both technical implementations from Europe and from USA. They also discussed the most recent developments in various jurisdictions when dealing with both directives and issues that matters to the Hong Kong investors. Nest has been investing in Hong Kong's entrepreneurs and talent since 2010, and a great supporter to build and shape the start-up eco-system here in Hong Kong to nurture this powerful new industry. HKVCA Chairman, Conrad Tsang, led the staff team for a tour of Nest's incubation centre and to learn on its seed stage investment model. HKVCA LP Committee hosted an year end luncheon to review the Association's progression in 2013 and to discuss the upcoming HKVCA initiatives in the following year. We would like to thank all 21 representatives from 19 limited partners institution to spare their busy schedules to join this lunch in the magnificent "Piso Comendador Arnaldo de Oliveira Sales" in Club Lusitano. On the evening of Dec 6 2013, HKVCA Christmas Cocktail attracted more than 80 participants attending this spectacular night. Special thanks to our our speaker Bertram Lai, Head of Research from CIMB, on subject "The Horizon of the IPO Market in Hong Kong and China". Thanks also to our Venture Committee and especially to our cocktail sponsors Teresa Ng and Patrick Lim from MB Global and Simon Mak from Ascent Partners. The HKVCA-HKU Private Equity Fundamentals Course is a comprehensive and intensive training program that has been specially designed for MBA students at the University of Hong Kong (HKU). The goal of the course is to provide these students with greater insight into and a more significant understanding of the fundamental principles involved in the private equity and venture capital industry. We would like to thank our speakers for their invaluable contribution and support. Anna Cheung from HKVCA spoke on due diligence and the investment committee process. Bonnie Lo, from NewQuest Capital Partners, spoke on deal sourcing and valuation. Thanks also to all members of the Education Committee, especially John Levack, for organizing this leading initiative in ppartnership with the HKU MBA programme. 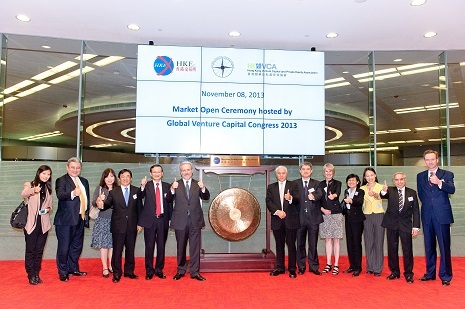 The 2013 Global Venture Capital Congress was successfully hosted by the Hong Kong Venture Capital and Private Equity Association (HKVCA) at Hong Kong Exchanges and Clearing (HKEx) on Friday 8 November. Representatives from as many as 21 different associations from around the world were in attendance. Chairman of the Global Venture Capital Congress, Terry McGuire, welcomed everyone to Hong Kong in his opening remarks before introducing HKEx Assistant Vice President, Issuer and Client Services, Global Markets Division, Michael Chan, and keynote speaker, Permanent Secretary for Financial Services and the Treasury (Financial Services), Au King-chi JP. Ms Au congratulated the Congress on holding its event in Hong Kong – and indeed in Asia - for the first time. “You have made the right choice to host the Congress here. where you can hear firsthand [about] the asset management opportunities in the East, and what this city may offer as China’s global financial centre,” she said. Each national delegation then presented a five-minute overview of the most pressing issues facing their respective regions and membership, including the major challenges, requests for support and feedback, and each delegation’s goals for the Global Venture Capital Congress. We would also like to thank Michael Chan, Assistant Vice President, for generously allowing us the use of their auditorium and host the Market Open Ceremony. Our extremely popular wine tasting event was, once again, oversubscribed with more than 75 people attending with a long waiting list of those wishing to attend. Special thanks to our sponsors Clifford Chance and Alter Domus. The star of the evening was “Master of Wine” Debra Meiburg who led us through the “sweetest night of the year”. As always the talk was both entertaining and instructive. Thanks also to our organizing committee and especially Alain Fontaine and Marcus Thompson for another very successful event. 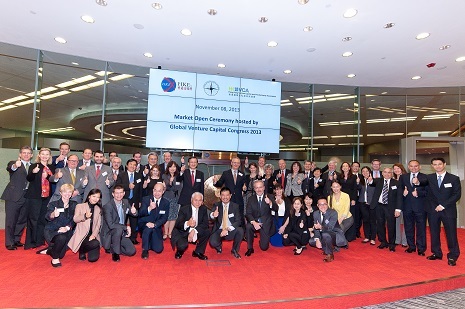 On October 19, 2013, Denis Tse, representing the HKVCA, hosted 23 fund managers representing a joint group from the Korean National IT Industry Promotion Agency and the Korean Venture Capital Association. The participants discussed Hong Kong’s current investment eco-system and the cross boarder opportunities that may exist for Korean managers. Special thanks for assistance provided by Eugene So from FLAG Squadron and Calvin Ahn from Prince Fund Management Limited. K O Chia, Director at Grace Financial Ltd., and Lorna Xin Chen, Partner at Shearman & Sterling, shared their expertise on how the different stages of family offices have evolved and PE and VC fund-raising from family offices in Hong Kong and across Asia. The talk, which drew an audience of 35 participants, also covered legal, regulatory and practical considerations for establishing and structuring family offices. On October 25, 2013, a luncheon talk was held at which Stuart Witchell, Senior Managing Director, Global Risk and Investigations, FTI Consulting, discussed the results of his analysis of the actions of short sellers in the market, with particular focus on Mainland Chinese companies as targets. The event attracted more than 50 attendees and was held at the China Club. On the evening of October 18, 2013, more than 200 enthusiastic young professionals joined our first charity mixer and beer pong tournament. We would like to thank all of those who attended this successful event for their generous contributions, with special thanks to Robert Walters, the key sponsor. On October 17, 2013, a luncheon talk was held at the offices of KPMG which was attended by an audience of close to 40 members. Speakers Tytus Michalski, Managing Director of Fresco Capital Advisors, and Simon Newstead, CEO of Frenzoo, shared their experiences as angel investors and entrepreneurs. They also discussed the most recent developments in Hong Kong and its increasingly important global role as a centre for angel investment and a venture ecosystem. Seminar with Cocktail: How Do Portfolio/ Operations Teams Add Value? On October 7, 2013, Joseph Wan, Cinven HK Ltd. as moderator successfully led an outstanding panelists of Leong Cheung from Bain Capital, Ivan Kwok from Cinven HK Ltd., James Redmayne from CVC Capital Partners, Derek Sulger from Lunar Capital, and George Lan from Resources Global Professionals shared with an eager audience of nearly 100 their operating experiences to add value to the portfolio companies. We would like to thank our Resources Global Professionals for sponsoring such great seminar and cocktails. The HKVCA-SFC Private Equity Fundamentals Course is a comprehensive and intensive training program that has been specially designed for professionals working at the Securities and Futures Commission (SFC). The goal of the course is to provide these professionals with greater insight into and a more significant understanding of the fundamental principles involved in the private equity and venture capital industry. On the afternoon of September 24, 2013, representatives from the HKVCA hosted five delegates from the Tokyo Stock Exchange sharing information on current TSE initiatives and capital market developments in the Topix, Jasdaq, and Mothers. We would like to thank Bloomberg for kindly allowing us use of their conference room. On September 9, 2013, the HKVCA joined InvestHK in welcoming Dr. Avi Hasson, Office of the Chief Scientist of the Government of Israel, to a special talk and discussion on how Israel encourages start-ups and possible strategies to further encourage start-up ecosystems in Hong Kong. With more than 50 members in attendance at the HKVCA’s 26th AGM at the China Club, the members elected 24 officers and board members and passed special resolutions aimed at providing clearer guidance with respect to the Association's corporate governance. We would like to thank all our valuable members for their continuous support to the Association during this past year. On August 30, 2013, Terry Hu, FountainVest Partners (Asia) Limited, Michael George DeSombre from Sullivan & Cromwell (HK), and Douglas Freeman from Fried Frank shared with an eager audience of nearly 50 their experiences structuring this pioneering deal. The event was held at the Sullivan & Cromwell (HK) office. Our monthly breakfast meeting was once again oversubscribed in August with more than 50 members in attendance. We would like to thank our sponsor, Factset, for helping make this great networking event possible for our members. The HKVCA’s 12th China Private Equity Summit was held on June 11 2013 at the Hong Kong Convention and Exhibition Centre. This year’s Summit proved to be our most successful to date, with more than 360 industry, entrepreneurial and governmental leaders attending from around the world. This represented the highest attendance ever for the Summit and we are especially pleased to have been able to provide attendees with a valuable forum at which to discuss the latest developments, trends and opportunities available in China’s private equity and venture capital markets. Among the issues discussed by the various panels at the Summit were the perspectives of offshore managers with respect to the current environment and the continuing challenges achieving exits; the views of domestic managers as to exit strategies in light of the challenges facing the A-share IPO environment; the latest developments in China’s capital markets; the continuing changes in China’s regulatory regime; and Chinese overseas investments. The Summit also featured a number of high profile keynote speakers. The opening keynote speech, which looked at PE investment from the perspective of sovereign wealth funds, was delivered by Dr Linbo He, Managing Director and Head of the Private Equity Investment Department at China Investment Corporation. Julia Leung, SBS, JP, Under Secretary for Financial Services and the Treasury Bureau of the Hong Kong SAR Government, and Weihua Rong, Director, Business Promotion Division, Authority of Qianhai Shenzen-HK Modern Service Industry Cooperation Zone, delivered keynote speeches at the luncheon highlighting the opportunities for PE and VC growth in the Mainland and the development of Qianhai as a major global financial centre by the year 2020. Closing keynotes were delivered by Dr Qiwei Chen, Founding Partner of ABC Capital China and Chairman of the Private Equity Association of Shanghai, who discussed the role of PE and VC in China’s evolving economy; and Xiqun Yi, Executive Vice Chairman of the China Association of Private Equity, who provided a review of the outlook for PE and VC investment in China. On behalf of the HKVCA, we would like to extend our sincere gratitude to each of our keynote speakers, event speakers and panelists for their invaluable contributions to the success of the event. We would also like to thank our sponsors who helped make this year’s summit possible: Gold sponsors: Morrison & Foerster and PricewaterhouseCoopers; Silver Sponsors: Blackpeak Group, InvestHK and Lunar Capital; Cocktail Sponsor: Shearman & Sterling. The HKVCA will as always continue its efforts to promote Hong Kong as a global centre for venture capital and private equity and to develop the city's role as the primary hub for cross-border networking, the exchange of ideas and deals, the creation of alliances and partnerships while always maintaining the highest standards of professionalism. We look forward to organizing our next China Private Equity Summit in 2014. This afternoon visit to Qianhai New Business Zone was co-organised with delegations from the China Venture Capital & Private Equity Association under NDRC. This group of 20 professionals had an opportunity to gain the firsthand experience and direct dialogue with Qianhai officials on the area’s future planning. During a midweek afternoon, Jean-Christian Six and Nicolas Papavoine from Allen & Overy, Eric Feyereisen from Banque Privée Edmond de Rothschild, and Olivier Coekelberg from Ernest & Young shared their expertise and thoughts on how to deal with the upcoming European Alternative Investment Funds Manager Directive. The annual HKVCA Golf Day was a tremendous success with 62 avid golfers teeing off under brilliant blue skies. After completing their rounds the attendees were treated to a networking lunch, one of the highlights of which was a raffle and auction that added to the all-around levity of the day. We would like to express our thanks to our sponsors, namely our Gold Sponsors Ernst and Young, Lexington Partners, Milbank and UBS; our Breakfast Sponsor, SEAVI Advent Ocean Private Equity; and Aon, our Lunch Sponsor. We would also like to thank the Golf Committee and those who were part of the team that contributed to the success of this most popular event. The HKVCA's VC and PE Education course was held in February and March 2013. This comprehensive training course, covering six modules in 18 hours, was led by a top tier faculty of highly seasoned senior industry practitioners and experts engaged in years of deal-making, structuring, and value-creation in companies and exits. Instructors drew on their extensive real life experiences to illustrate their points.